These are higher traffic streets such as Burdett Ave, Congress Street, Federal Street, and 2nd Ave. These would be candidates for some robust bike lanes options such as cycle tracks (which some sort of barrier to separate a bike lane from car traffic), buffered bike lanes (a regular bike lane with striped buffer zone separating it from the vehicle lane), and striped bike lanes. These are medium traffic streets such as 4th Street, Campbell Ave, and Oakwood Ave. They'd be candidates for amenities such as striped bike lanes, "contra-flow" bike lanes (which allow cyclists to ride in the opposite direction of vehicular traffic), a new higher-visibility markings at intersections. As the name suggests, these are relatively low-traffic streets within neighborhoods. Street treatments could be focused on calming vehicle traffic via things like speed tables and small neighborhood traffic circles and curb extensions. There's map at the top of the proposed bike routes and categories -- click or scroll all the way up. Part of the plan includes a project that's already been rolling along: the South Troy Riverfront Bikeway -- which is pretty much what it sounds like. 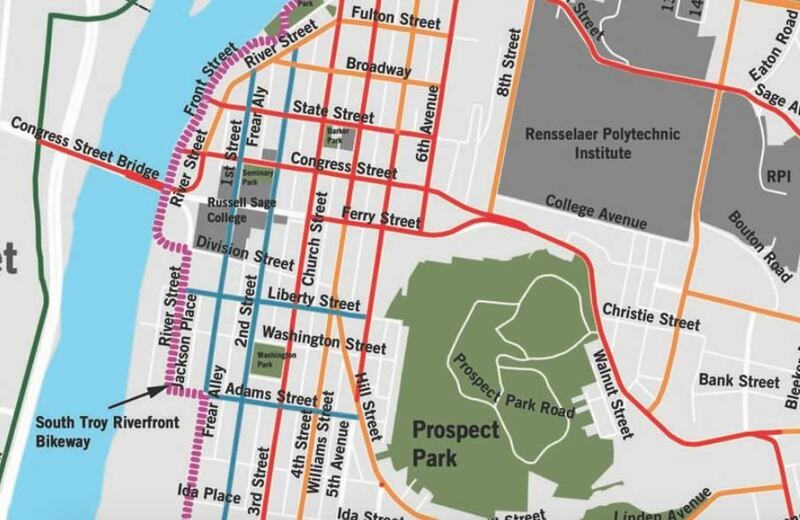 It would create a bike corridor stretching from South Troy up to the Uncle Same Bikeway north of Hoosick Street. The city of Troy is planning to move forward with the project in 2018. Among the notable aspects of the plan: A two-way cycle track -- that is, a separated bike lane -- that cover about a third of the route. If that ends up being built, it would be the first such bike lane in this region. + How best to deal with east-west connections that travel up the hillside in Troy. Ceponis said there's some thought that maybe there could routes that zig zag up the hill so it's not so hard a climb. + Ways in which bike infrastructure might also help people with disabilities. + More awareness and connections for the Uncle Same Bikeway, which despite its location in the heart of the city, has relatively low levels of use compared to other trails. Ceponis said planners are looking for feedback -- and a form on the project website if you'd like to offer some ideas. She said the final plan is expected be ready in early 2018. How can you call something a "primary bikeway" if there are signs saying you cannot ride your bike on it? The Troy-Menands bridge has large signs saying that "cyclists must walk". In fact, from Mill Street to the other side of the bridge, according to the signage, bicycles are not supposed to be ridden. That's something like 3/4 mile. Yet that's a "primary bikeway"?